The staggering predicted revenue for this market equates to a 40% increase and reinforces the rapidly growing importance of smartphones to the music industry. Users are constantly connected to their phones and this can often make them a more favourable option than an mp3 player. We’ve come along way since the days when we simply paid for our ringtones and there are vast sums involved in the mobile music industry. But as most smartphones come fitted with an FM radio, mobile music services must offer greater value and this has seen the creation and success of such streaming apps as Spotify. It is worth mentioning that such apps help eradicate incidences of music piracy, as they are completely legal and pay royalties to the artists. Devices such as the iPhone continue to use a pay per download method, so don’t expect the number of mobile song downloads to fall too sharply. However it is believed that Apple and Google will move into the streaming arena, to compete with the likes of Spotify and Pandora. 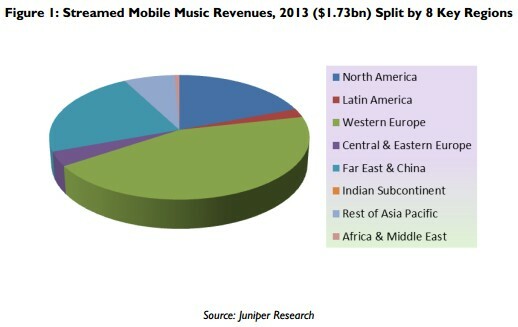 The rise in mobile music revenue is largely a result of better integration between operators and third party providers. Unsurprisingly Western Europe and North America account for the majority of the $1.73 billion revenue expected to be achieved this year.